On Monday, we went downtown for lunch and a stop at Stuttgart’s Markthalle or indoor food market. I also stuck my head in the stylish home goods store that occupies its second floor and discovered that it was having a 50% off sale on Christmas ornaments. 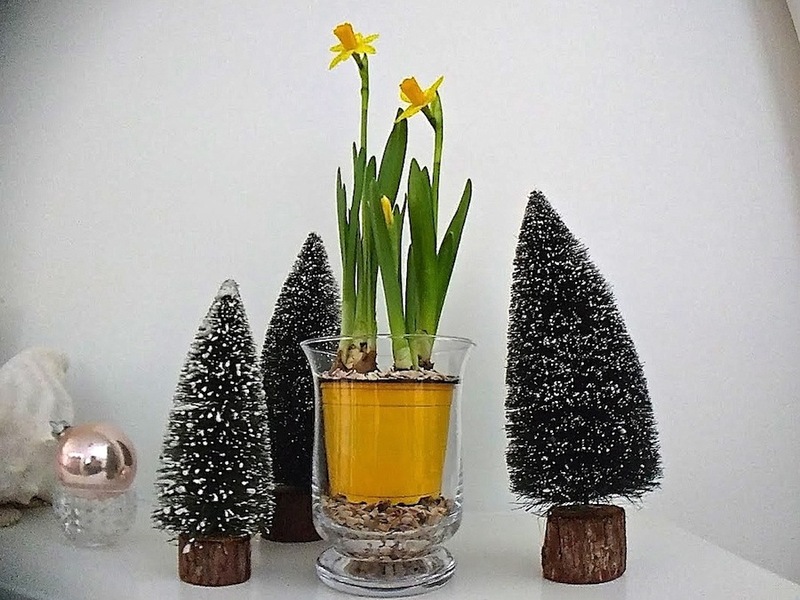 So I bought five of these little trees, which I had coveted earlier in December. At the same store, I also picked up some forced daffodils (1.90 euros). 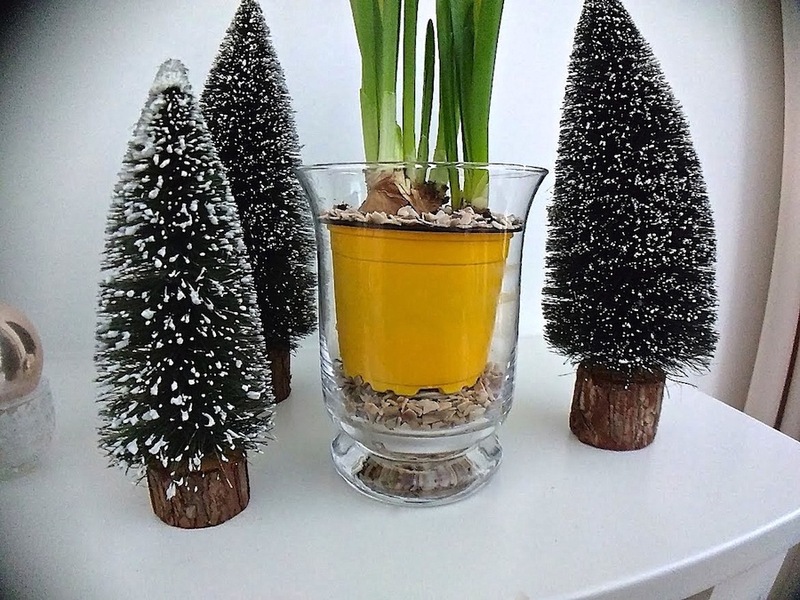 I liked the bright yellow plastic pot that they were already planted in, so I just dropped them into a little glass vase with some shell chips. Two of the buds opened up overnight. Very early thoughts of spring. . .
To see what other garden bloggers put in vases yesterday, please visit Cathy at Rambling in the Garden. 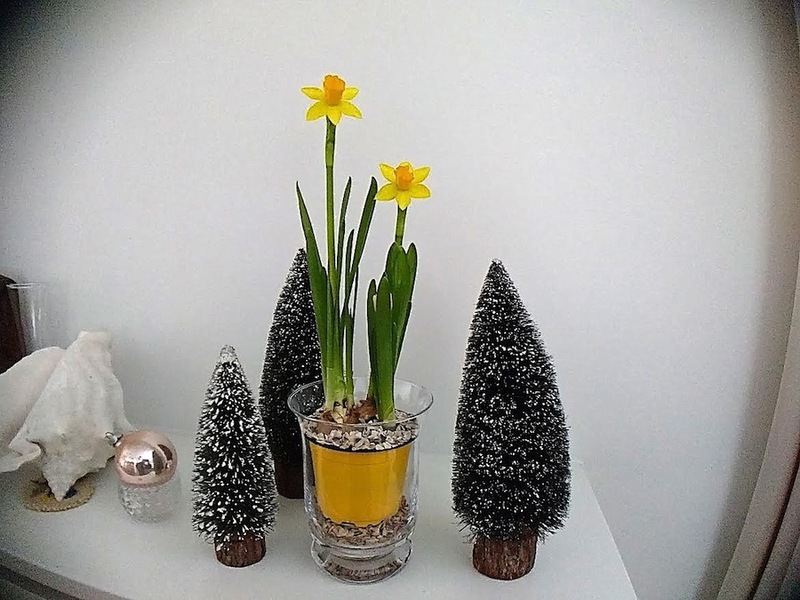 Sweet arrangement — both wintery and harbinger of spring! Happy New Year. Thanks! 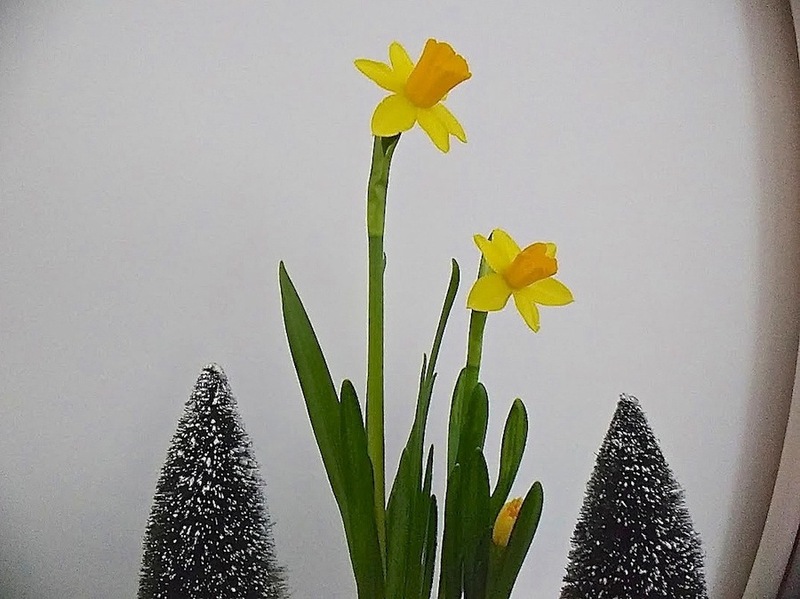 I was a little surprised to see yellow daffodils this early. Love everything. The yellow pot is perfect and it’s nice not to have to disguise the container. I have a couple of very similar trees that have been in my family for many years. And nothing better than finding something you wanted earlier now on sale. The funny thing is that if the store had been better at putting prices on things in December, I would have bought them at full price. But none of of the trees were stickered and I couldn’t find anyone to ask, so I left. But I think now they will make a good decoration for January — snowy trees. We actually had our first snow yesterday, as well.